Monetti Homes is a full service, building and construction company based in Manahawkin, NJ, servicing Long Beach Island and the surrounding areas. 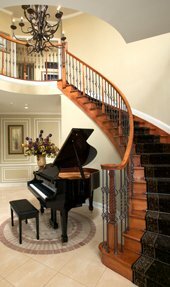 We focus on quality workmanship with attention to detail. Large or small, simple or complex, we have the knowledge and experience to provide you with a completed project that is exactly what you envisioned. During our initial consultation, we will spend all the time necessary to explain how the process works and what to expect. We have built solid partnerships with design professionals throughout Ocean County, NJ, that will design your project and prepare all the documents needed for us to build your home responsibly. We also have long term relationships with all of our vendors which will provide you with the service you deserve well after your project is completed. Built with quality and care, your project will be managed by an owner. Excellent customer service and communication is our ultimate goal and our most important customer is you! At Monetti Homes, our goal is to develop a possible communicative relationship from the onset. Once that relationship has been established, we finalize a plan and construction documents and then begin the process of bidding and budgeting. We strive to help you use your budget wisely and practically. We always weigh the pros and cons of each component and aspect of your new home and explain them to you fully. During the design phase, we will take the time to help you make choices that work for you and fit your budget. For example: if a gourmet kitchen is what your heart desires, we’ll spend the time to help you make your kitchen look and work perfectly for you. If cooking isn’t your “thing” and you prefer to enjoy the outdoors on your deck or covered porch, then the focus will be outdoor living. We can and will make the spaces that are most important to you the focus of where and how to best budget your project. We’ll ask you for decisions on all areas of your home during this phase. While this can be somewhat overwhelming; no worries. We can help you as much as possible and make suggestions to help ease the burden. For over 50 years, the name Monetti and building has gone hand in hand. Tom Monetti is a product of the Monetti construction history as a third generation home builder. In 1948 my grandfather, Louis H. Monetti, my father Lewis and my Uncle Donald, founded L.H. Monetti & Sons Builders. My grandfather, a brilliant man with only an eighth grade education who understood the value of honesty and hard work, saw a need for homes in New Jersey after the war. Working with municipal officials, his vision was to build nicer homes for families for a fair price. These principles were highly successful and well received. Since the very beginning, the name Monetti and building has endured and thrived. During my youth, I took every opportunity to learn the building business alongside my father. My brothers, uncles, and cousins were always around and heavily involved. The Monetti way was to learn the hard way. My father told me many times, “You can’t tell the mason how to lay a block or finish concrete unless you know how to do it yourself.” So I worked alongside each trade, gaining a well-rounded knowledge of all facets of construction. From the time I was old enough to work, I spent summers and school recesses working for L.H. Monetti & Sons mostly doing the “grunt” work or the work nobody else wanted to do. I was the youngest or the “low man on the totem pole.” As time passed, I eventually was allowed to pick up a hammer and actually follow my father’s footsteps of becoming an accomplished carpenter en route to becoming a builder. Later on, when my father decided it was time to slow down, I relocated to the Jersey Shore where I worked with family again, this time with my uncle and cousin. During this time I honed my skills and gained invaluable experience working on remodeling projects, additions, alterations and new homes along the Jersey Shore. My experience was about to be taken to another level as I moved from working in the family business to working for a leading national homebuilding firm. I wanted to work on large scale projects and this afforded me the opportunity to do so. The next seven years of my career was spent building hundreds of homes on numerous projects with many receiving awards and accolades on many levels including “Best Single Family Home” and “Community of the Year.” Personally, I was recognized as “Superintendent of the Year” an award that I cherish to this day. As the times changed, so did my career. My goal then, as it is now is to be well rounded and able to undertake any project that comes my way. After a company change, I worked for a medium sized company that focused on detail and quality which was right in my wheelhouse. Blessed with a vigorous economy the company and I grew quickly. Starting as a Project Manager responsible for one site, I was elevated to Construction Manager, responsible for numerous sites to Director of Construction responsible for all land development, construction and warranty for the company. “Construction Executive of the Year” was awarded in 2004 by the Jersey Shore Builders Association. I created the company’s warranty department and was instrumental in the homes’ designs, project planning, and execution. I'd like to thank Tom Monetti of Monetti Homes and his crew for the job they did in restoring my home after superstorm Sandy. 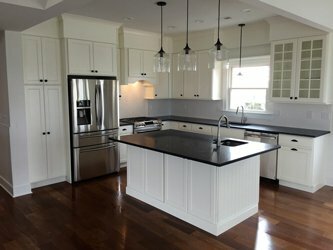 I have been involved in construction for over 50 years as a retired plumbing contractor and held many N.J. licenses including Construction Official and I can say Tom's professionalism, knowledge and courtesy has brought back my 10 year old home to even better condition than the day we moved in. His crew did a super job and I would like to thank them as well in putting our lives back together after that terrible storm. I would highly recommend them. We had never planned on raising and renovating our home on Long Beach Island, New Jersey as we had a contract to sell it prior to Superstorm Sandy hitting the Jersey shore. In addition, we reside full time in South Carolina so all work had to be done long distance. Unfortunately, our home sustained a lot of water damage on the entire first floor which made the project a necessity. We were so extremely fortunate to have Monetti Homes,LLC take over the demolition and reconstruction for us only a few days after the storm. The experience was more than a positive one, it was a major relief. Tom Monetti had superb contractors who were knowledgeable, available, and flexible. They paid careful attention to detail in all aspects of the construction. All the contractors we dealt with were truly professional craftsmen who were neat, courteous, and above all, honest! If any issues arose, Tom was always quick to respond, and he was available at all times to discuss anything and everything. The workmanship in the home, and the scheduling and supervision of the project showed the building integrity of Monetti Homes, LLC. As anyone knows who was affected by Sandy, the insurance and FEMA processes were not the fastest so it took a lot of stress off us to work with someone who was flexible enough to adjust to our time frame and deal with adjustors on our behalf. The finished home was so beautifully constructed that we had second thoughts about the sale. It is without hesitation that we recommend Tom Monetti and Monetti Homes, LLC since it is an outstanding, professional company. My company Shoreline Plumbing & Heating Inc. has worked with Tom Monetti for over twenty years. He is extremely knowledgeable about all facets of construction , he is honest with his customers as well as his sub-contractors . His customers are always his first concern , his commitment to quality and cleanliest of his job sites is unlike any other builders that we work with. His scheduling is the finest I have worked with which in turn puts his customers on tract to enjoy there new home. Being a sub-contractor for Monetti homes , it is a pleasure dealing with Tom and his team. When Tom calls to schedule work we know that when we arrive at his job that it will be ready and a clean and safe environment for my crew to work in and complete our job. When I need work done on my own home or if a family member needs work Tom Monetti Homes is the only contractor that I would use or recommend. Hiring Monetti Homes was the best decision we made after our home was made uninhabitable after Superstorm Sandy. Tom with us every step of the way from the beginning to end and explained the entire process up from so there were no surprises. He worked with our suggestions as well as making some of his own when needed. His attention to detail was outstanding and was quick to respond to any of our questions and keep us abreast of progress along the way. Unlike some of the larger builders in the area, Tom himself was on site overseeing construction on a daily basis to make sure everything was built to his own high standards. We could not be happier with the job Tom and his team did building our dream beach house and therefore we recommend Monetti Homes highly. The Belyea Family would like to thank the Monetti Homes’ Team for all their efforts in reconstructing our home after the damage from Hurricane Sandy. 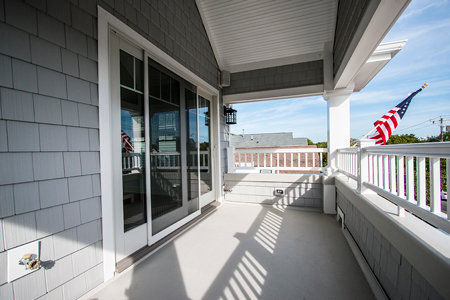 We feel that you have provided us with one of the highest quality redesigned homes on Long Beach Island. It was a long and difficult road from Sandy until now but with the end product we have now, we feel it was well worth the time and money spent. Both you, and your sub-contractors were a pleasure to work with throughout the whole process. We appreciate how well you worked with my wife and daughter in law in regards to the attention spent on every little detail to make our home a unique and special property. From the exterior to the custom interior (including fitting and elevator into the existing structure, which was no small task) we could not be more pleased with the final results. As I said, this was an arduous process but it proved to be very rewarding with the proof being in the final results. Our experience with Monetti Homes was absolutely wonderful! From beginning to end, we were more than satisfied with the transformation of our sixties ranch to a modernized, functional and spacious home. When we first met for the initial consultation, you took the time to fully understand our expectations and helped us to achieve our goals within our financial constraints. The initial timeline you provided, along with the weekly updates on progress, were not only accurate but showed the level of detail and attention you gave to our project. In addition to staying with the outlined schedule and keeping us informed, what is especially impressive with Monetti builders is the quality of work provided and the impeccable neatness maintained. Living in our home throughout this project, we saw firsthand on a daily basis how you worked and the standard of care you upheld. We cannot thank you enough for taking care and being conscious of our needs as we remained in the house. Our finished interior renovation is more beautiful than we could have imagined. Our kitchen is gorgeous and truly makes a statement about our home. Your many suggestions and recommendations added to the detail and functionally within each room that you worked. We are enjoying all of our new spaces and are looking forward to working with you again as we update the exterior of our home. We give the highest recommendation for your honesty, integrity and craftsmanship.